Today is the eve of the feast of St Patrick. As the country gets ready to celebrate our national saint with street parades, parties, turning buildings green and the odd pilgrimage, people are carrying on a tradition of venerating St Patrick that dates back to the 6th-7th century, if not before. Although many modern celebration of the saint are secular in nature the relics of medieval devotion to Patrick are to be found across the Irish countryside, where rocks, stones, holy wells, mountains, islands and roads are dedicated to the saint. Many of these holy places are still visited today on the saints feast day and at other times during the year. One of the earliest medieval accounts of pilgrimage in honor of St Patrick concerns pilgrimage to the holy mountain of Croagh Patrick, in Co Mayo. Legend had it the saint fasted here for 40 days and nights and banished all the snakes and demons from Ireland. We are told that in 1113 a group of unfortunate pilgrims suffered a terrible misfortune, when they were struck by lightning while praying on the summit. Unfortunately we are told no more details and we can only imagine how the events unfolded. 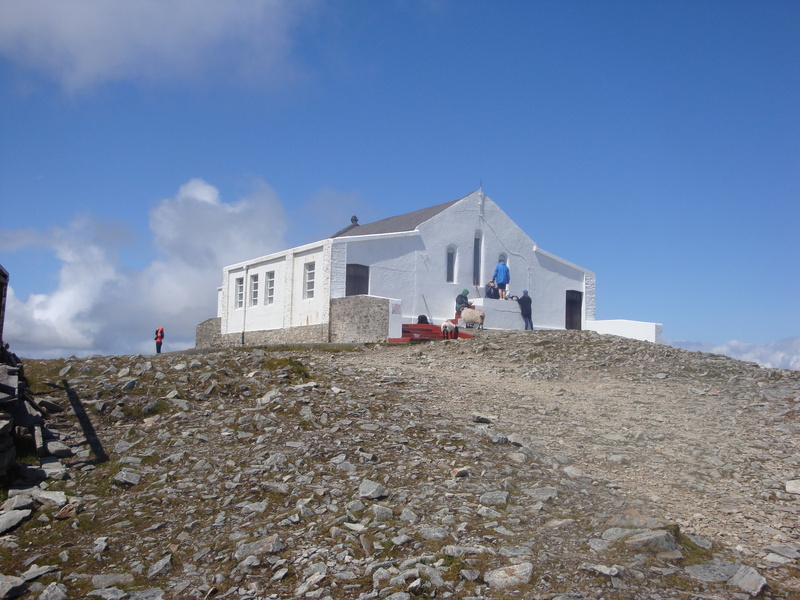 Croagh Patrick is a 764 meters (2,507 ft) above sea level and its very exposed spot. It is a very dangerous place in bad weather. Each year people fall and injure themselves. There are also recorded incidents of people getting hypothermia. According to the annals the pilgrims were fasting and performing a night vigil on the summit of the mountain. Archaeological evidence suggest there was a small church similar to Gallarus on the summit as early as the 8th century ( to small to hold a large number of people). Most of the pilgrims were probably outside praying when a lightning storm came upon them. Humans or animals struck by lighting may be killed or suffer sever injury due to electrical burns.We do not know how many people were present that night but the weather conditions must have been extreme to result in the death of 30 people (although it is possible these figures are exaggerated). There may also have been many more injured. To get help those who were not injured would have had to climb down the mountain a good 2 hours walk from the summit of the mountain to the base. 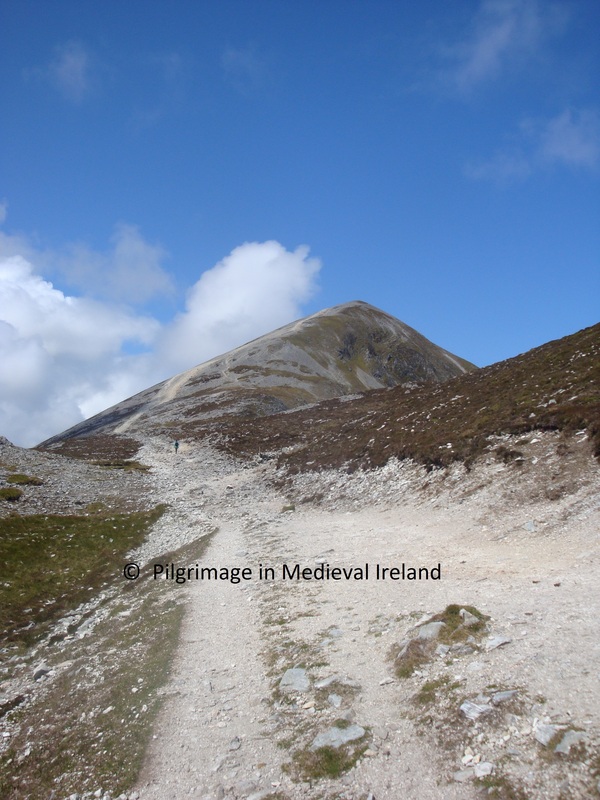 This tragic event did not deter further pilgrimage to Croagh Patrick and Jocelyn’s twelfth century Life of St Patrick which records ‘That many are accustomed to spend the night awake and fasting on the mount’. In the centuries that follow there was a marked shift in recorded dates of pilgrimages away from St Patrick’s day to the summer months when the weather was better. Today very few people climb the holy Mountain on St Patrick’s day and modern pilgrimage to the Mountain focuses on the summer months, last Friday of July, last Sunday of July, the 15th of August when the weather conditions are more favorable. 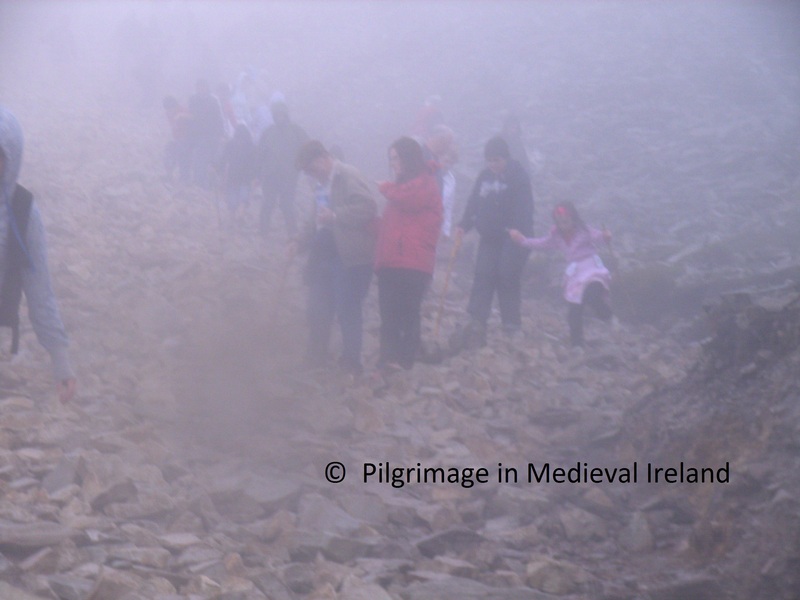 This entry was posted in Uncategorized and tagged Croagh Patrick, medieval pilgrimage, St Patrick's Day, St. Patrick.